Thanks to “Let’s Keep Children in Families” charity program implemented by the joint efforts of Ucom Foundation and World Vision Armenia this month as well the Ucom subscribers have helped 2 more families to create their source of sustainable income. 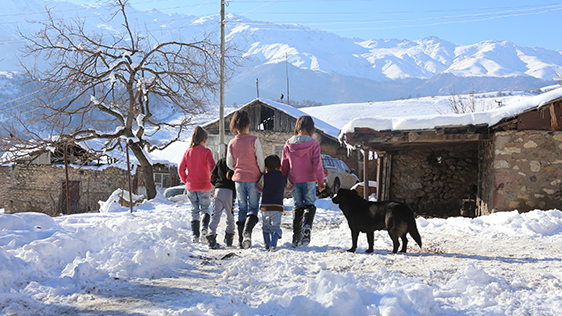 This time the support was provided to the family of Zakaryans with 2 children and the single-parent family of Balayans with five children, living in Syunik region of Armenia. Zakaryan family lives in poor socio-economic conditions in their relative’s house. Parents have higher education, but are not employed and thus have no opportunity to provide the minimal needs of their two sons. Zakaryans’ eldest son has disability since early childhood for he was diagnosed with cerebral palsy. The income source of the family are the father’s disability pension and the family poverty pension, which are barely enough to cover the most urgent needs of the Zakaryans. Although there is quite a difficult situation in the family because of the dire social conditions, the parents treat their children with great love and care. In the family of the Balayans the mother was going to deliver her fifth baby, when her husband suddenly passed away in a heart attack, thus leaving the care and upbringing of their children on his wife’s shoulders. The Balayans live in exceedingly poor housing conditions, the source of their income are the family poverty pension and children’s pension for the unilateral abandonment of the family, which are not sufficient to meet the primary needs of kids. Within the scope of “Let’s Keep Children in Families” program, taking into account the tailoring skills of the Zakaryans mother for the improvement of the socio-economic conditions of the family, Ucom Foundation has provided her with working tools and necessary accessories: sewing machine, overlock machine, iron, textiles and etc. Meanwhile, the Balayans were provided with a cow, calf, forage, the improved minimal sanitary conditions, children were given some clothing and bedding. All these will help families ensuring their steady income and improve their socio-economic situation. Both family mothers are now convinced that they will be able to satisfy the most basic needs of her family and to keep her children home under the parental care. “Today we conclude the process of SMS-charity of this year, thanks to which Ucom subscribers helped creating a sustainable source of income for the families living in extreme poverty. During the three years of project implementation 49 families received support within the scope of the amount gathered via SMS-donations and doubled by Ucom”, - said Ashot Barseghyan, the head of brand development and communications department at Ucom. “Within the scope of World Vision and Ucom Foundation joint program we provided the Zakaryans family with an opportunity to deliver tailoring services, conducted different workshops for Mrs. Anahit and helped her develop her skills. Meanwhile, it is not only the material assistance that we provided to the family of Mrs. Veronica, but also support on the basis of the individual development plan drawn up by World Vision. In both cases by creating stable income sources we prevented children from landing in boarding institutions”, - said Artak Ordyan, the head of marketing at World Vision Armenia.